Hand-painting our custom stencil design at Longway Tavern in the French Quarter of New Orleans. One might argue that stencils and stenciling are the original form of the decorative arts. Dating back over 37 thousand years, Neanderthal cave art employed what were the first known use of stencils. Hands were placed on the walls of the caves and crushed pigment was utilized (likely, blown) to create a “print” of said hand! As we noted before, in our article on “What is Today’s Decorative Artist?”, the decorative arts are often defined, in part, as being “functional.” These cave paintings featured scenes relevant to the cave artists and their people. They may be forms of communication and/or ritual. One way or the other, it seems clear they are functional. See more of our stencil work here! 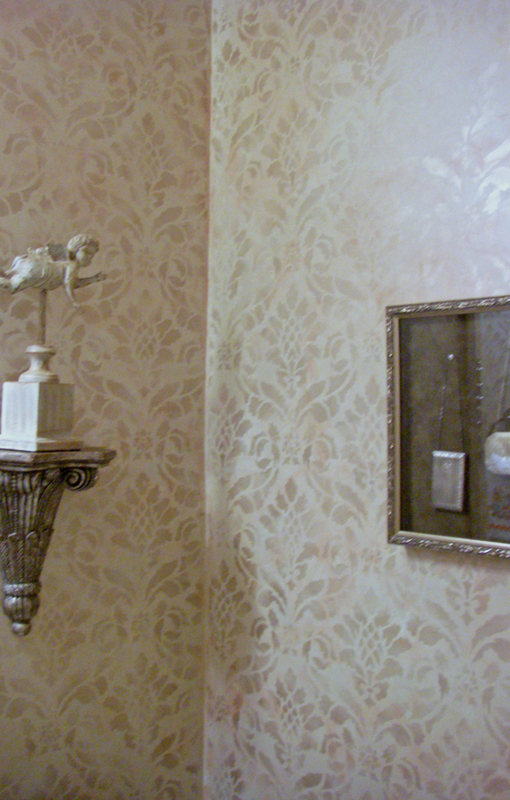 Pictured above – Hand-painted Damask style stencils in a New Orleans residence powder room. 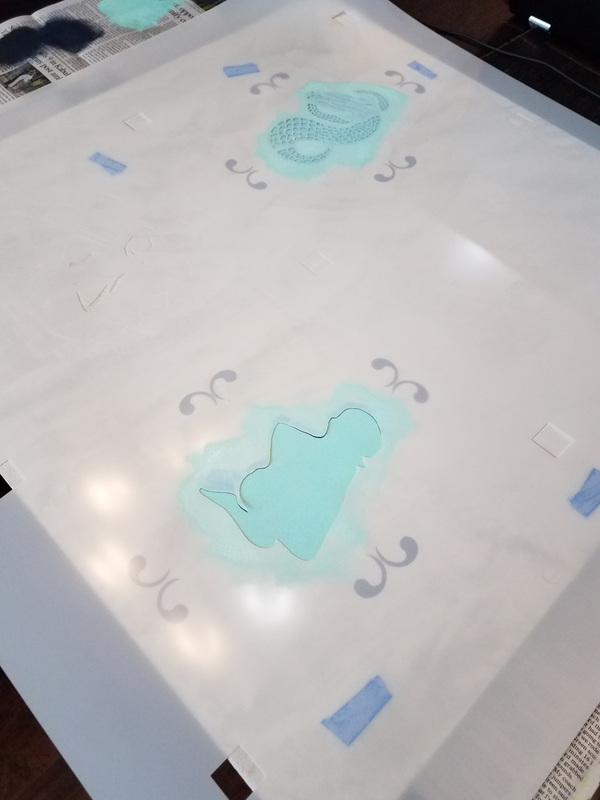 Fast-forwarding to a few thousand years ago or so, we find that stencils were used in detailed and complex works such as those found on the inside of Egyptian tombs and the walls of Pompeii, as well as other large swaths of the ancient world from the West to the East. As early as the 5th century BC, the Etruscans were using copper stencils on vases. Examples of lettered stencils used to initial documents are known to exist as early as the 6th century AD by historical figures such as the Roman Emperor Justinian and Charlemagne. A significant development was the first use of stencils in artistic printing. The earliest examples of this date the beginning of the 2nd century AD in China. From there, stenciling quickly found its way onto clothing and other forms of cloth. The Japanese developed the “katazome” technique, using the paste resist method where paste is pushed through a stencil. Dating back to at least the 7th century, it was originally a print-on-paper method, as well. By the 17th century, it had blossomed and was also widely used on textiles. 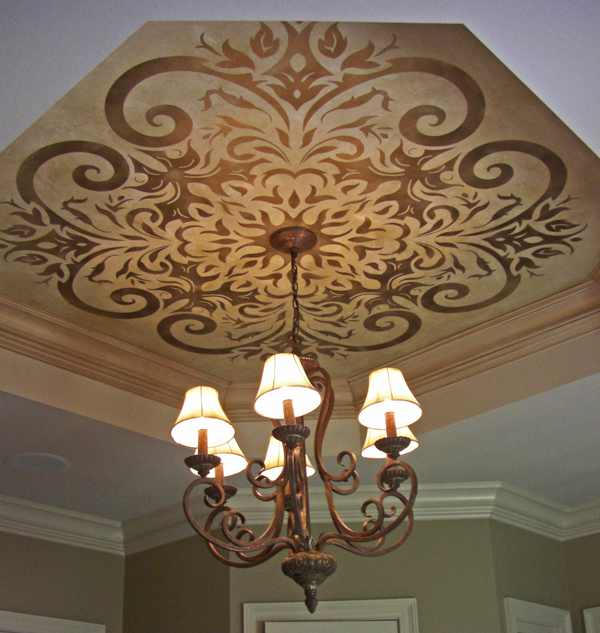 Pictured at left – Hand-painted ceiling stencil in a New Orleans residence. Thanks to the trade routes that connected the East to Europe, goods as well as ideas and techniques were transmitted. It seems likely that stencils were reintroduced or, at the least, their use in the West was influenced through this mechanism. By the Middle Ages, stencils were widely used in highly intricate and detailed fashion in church decorations and manuscripts as well as on music scores and political banners. 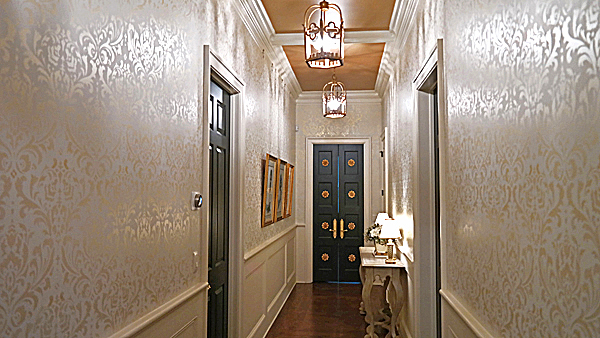 Pictured above – Hand-painted Damask motif stencil in a New Orleans residential hallway. Wallpaper was invented in the early 16th century and stenciling was used for its decoration from the outset, often with naturalist and floral patterns. By the late 17th century to the early 19th, stenciling was widely popular in Europe. 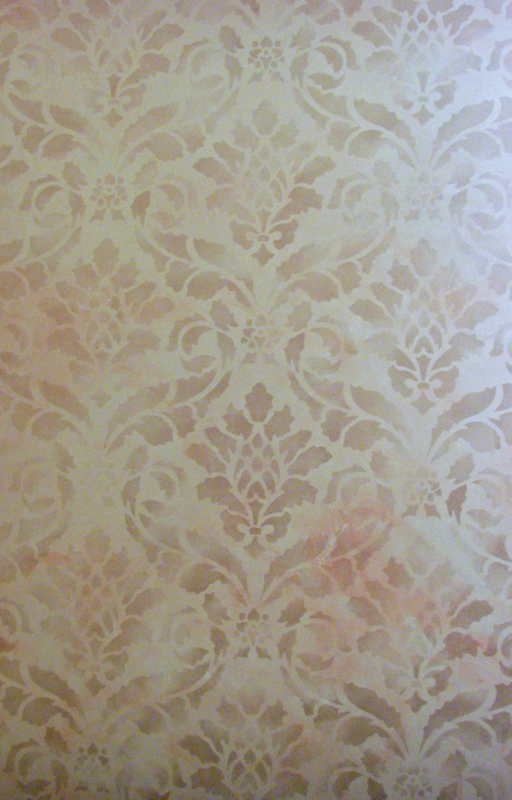 Applications of stencils were used in ornate motifs in Baroque and Rococo design. These were used in churches and palaces and on furniture and textiles in addition to wallpaper. Though the exact origins of who or what group or groups of people first introduced stencils to the United States, it is clear that it was present in the region by the colonial era. 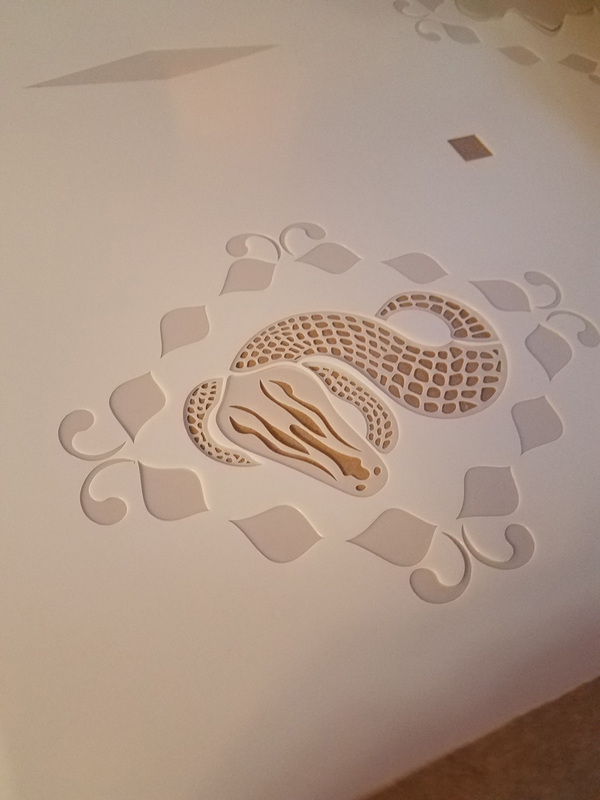 Pictured above – Custom stencil designs for a lounge and restaurant in the French Quarter. In the post-Revolutionary War United States, stencils were widely used and became very popular and more accessible to people beyond the very wealthy. 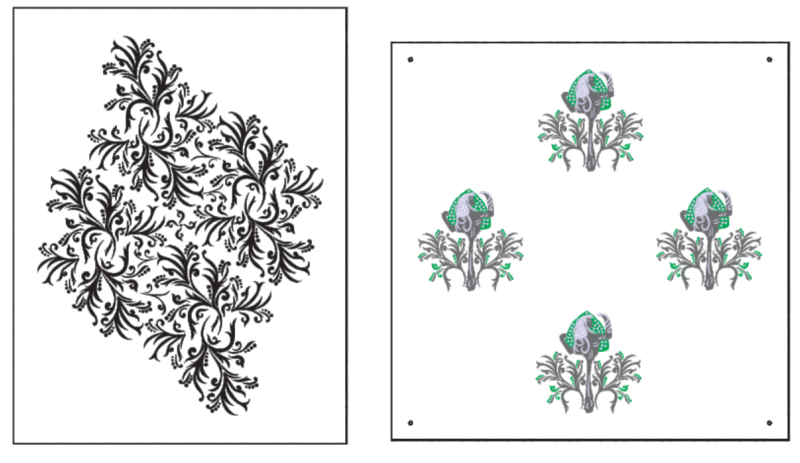 They were used on walls, ceilings, a wide variety of furniture, pillow covers, curtains, and other fabric applications. 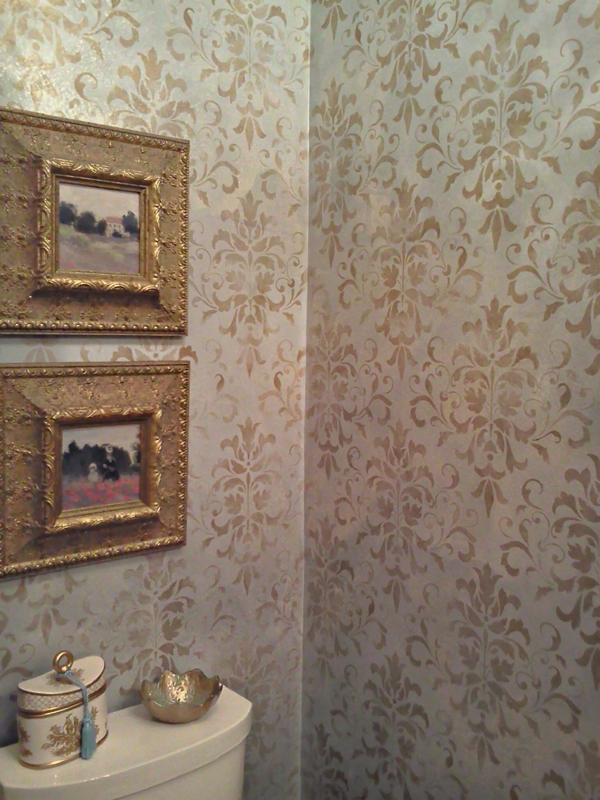 Stencil use on walls was a popular alternative to wallpaper during this period in the US, as wallpaper was costly and only available via importation from Europe. 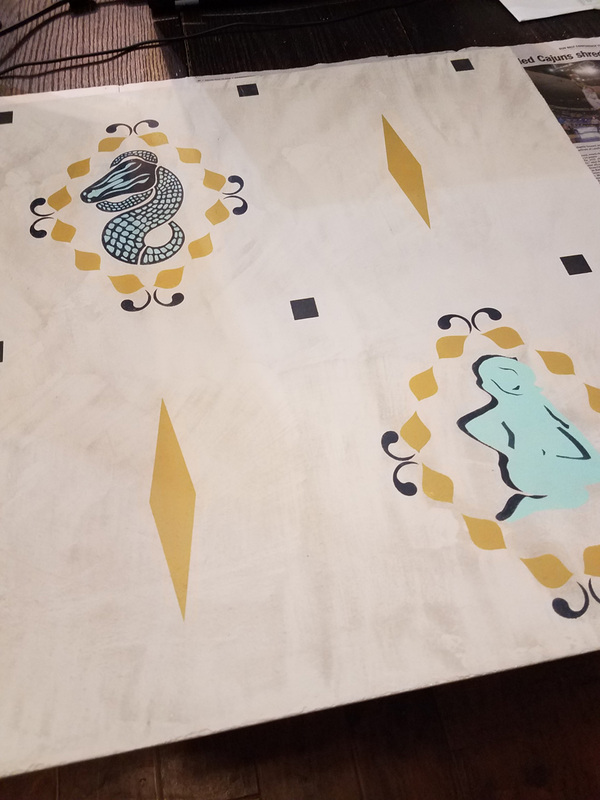 Also, it is believed that itinerant painters, relatively common in this era in the States, used stencils frequently as they were easier to transport than wallpaper and could be used repeatedly from job to job. Stenciling remained very popular in the US throughout the 1800’s. Designs became more elaborate and begin to show differing influences in the motifs such as Roman patterns and contemporary designs. 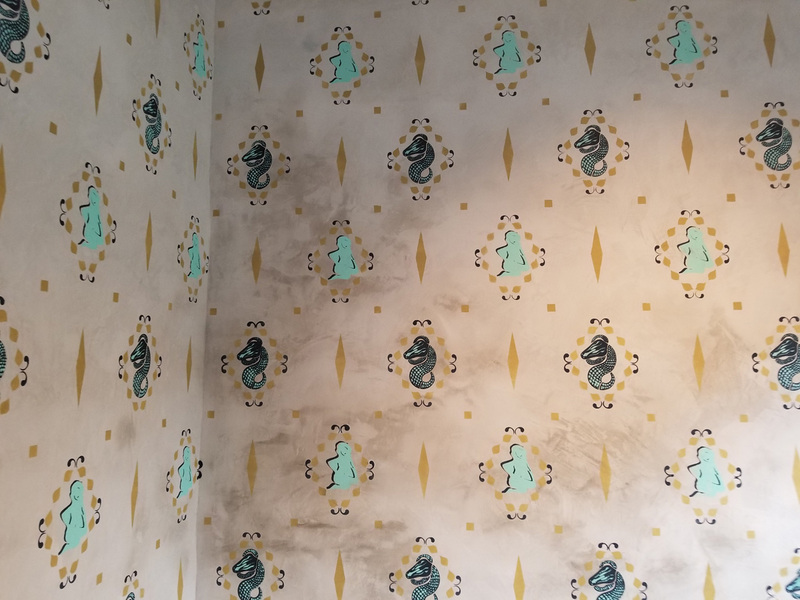 Though wallpaper became much more cost-effective and accessible (no longer coming only from Europe along with the introduction of cheaper materials and production methods) by that latter half of the 19th century, stenciling did not disappear. The industrial age brought mass production of stencil patterns that were heretofore only available to those who, largely, made them by hand often using unwieldy materials. As the middle class grew during this period, stenciling remained a popular technique for an increasing number of people looking to show off their affluence. It was also a time-saving and highly portable method available to artists, decorators, and painters. Pictured above – Initial design and mock-ups of our custom stencil design for Longway Tavern in the French Quarter of New Orleans. By the 1940’s, various factors including the continued use and cheaper cost of wallpaper, the decline of the artisan/decorative artist through a lack of training and skill, and more modern and minimalist trends in design and architecture led to the greatly reduced use of stencils. That is changing today, and stencils are coming back into vogue in a big way. Here at Sylvia T Designs, we are helping to lead that charge delivering classic motifs and patterns, such as Damask and floral looks, to modern, custom-designed patterns only limited by your imagination! 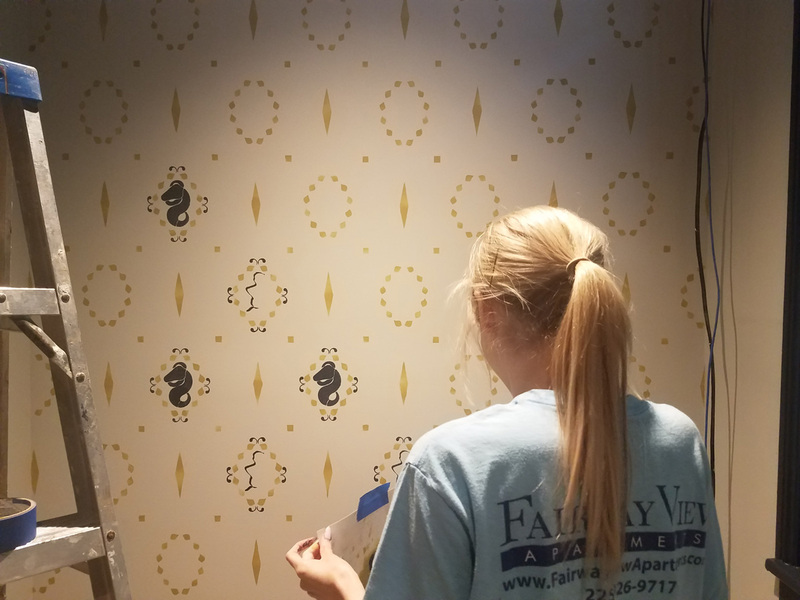 We can produce stencils that provide a cost-effective and more durable alternative to wallpaper (see more on that here.) Our use of modern design technology allows us to create designs of any look or inspiration, from the relatively simple to the highly ornate. Pictured at left – Applying and hand-painting our custom stencil design at Longway Tavern in the French Quarter of New Orleans. 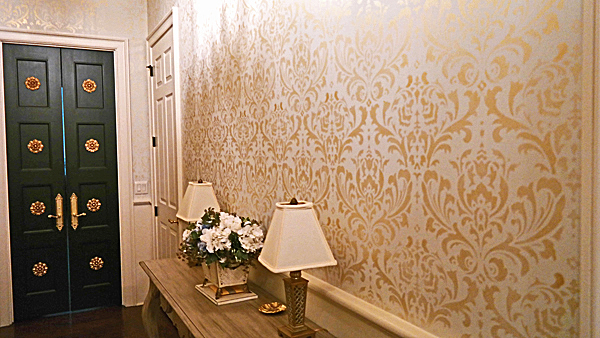 Sylvia T Designs is the premier stencil decorative arts firm in the New Orleans area. 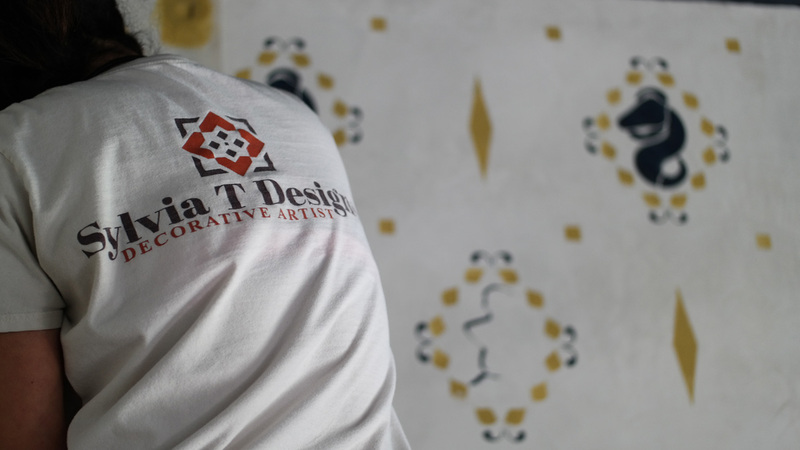 Drop us a line and learn more about how we can create a truly unique and hand-painted stencil in your space! See more of our stencil work here. 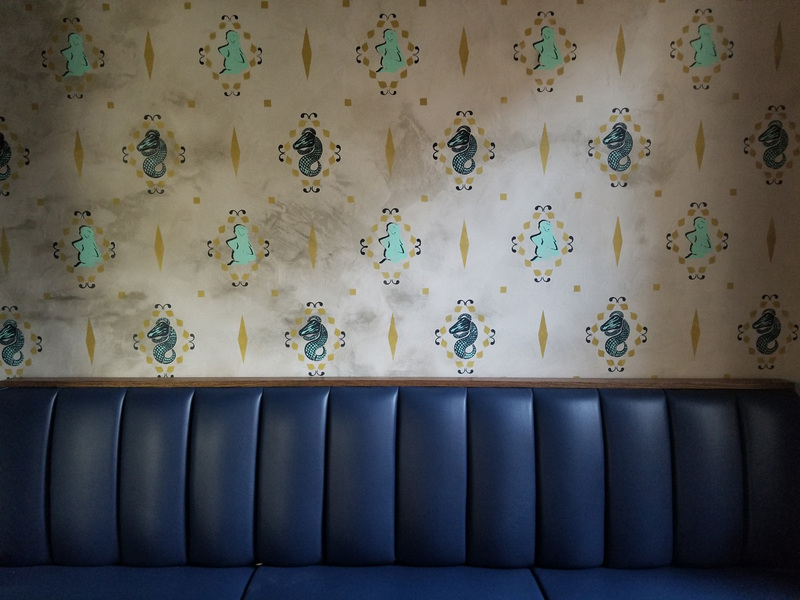 Pictured above – Final look of our custom stencil on the walls we also plaster finished – Longway Tavern, French Quarter, New Orleans.